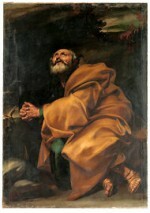 The Metropolitan Museum has acquired an early Jusepe de Ribera painting, a 1612-13 depiction of St. Peter praying on a rock, painted when the artist was in his early 20s. Paintings from this period rarely come on the market; about 10 years ago an Italian scholar named Gianni Papi reattributed several paintings to the young Ribera. This particular painting was only discovered last year and was offered through Madrid dealers Coll & Cortés. This entry was posted on Friday, November 9th, 2012 at 9:45 am	and is filed under Art News. You can follow any responses to this entry through the RSS 2.0 feed. You can leave a response, or trackback from your own site.